So he just flipped out for no apparent reason ? That...that doesn't seem like Pat...not at all. 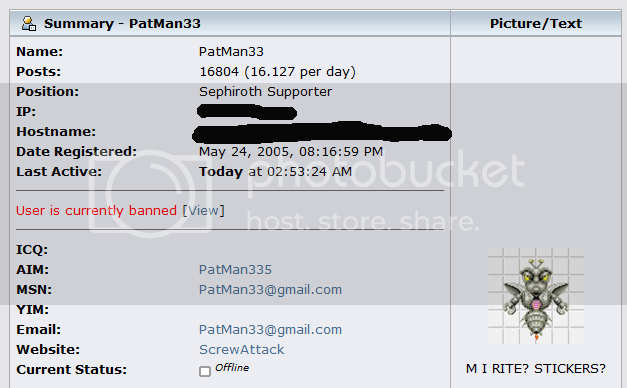 I am not implying this is a joke but it's still pretty strange to find Pat going off like that. Meh, I wasn't there to see what happened but it's just a guess he went way off the safe zone of speech and conduct. Even though I have been here for a short time I know that Pat iswas one of the most mellow and well respected members on GS. He helped us so much, I don't understand how he could just go nuts over a one foul word and even come to the sleazy option to threaten mods. I just hope he's ok . I JUST DONT KNOW WHAT TO BELIEVE ANYMORE. This is either the most convincing April Fools ever, to the biggest co-incedence ever. You're actually convincing me, but all I can think of is "April 1st, It can't be true." Until tomorow, I'm thinking eloborate hoax. Very, very eloborate. What if someone else was using his computer? Like what happened to c14dude? I don't believe this anyway. I am really disliking the Star Wars retrospective for some reason. It's nothing but ****** talk. I'm not sure why that word isn't in the filters but, I've *'d it out. Please don't use it anymore. I'll ask Steve to add it to the list. Like what happened to c14dude? Was he a member? I wasn't here long enough to know, but I see him as a guest and I always wondered in my lurking days, "How the heck can he make a thread, or comment, if he's not a member?" No more discussion of it please. May I ask why the off topic topic needs to be deleted? This will be the last day to post in this topic. Since Pat is gone this topic will be locked tonight and deleted in the morning. If you post here alot, expect your post count to go down tomorrow. You have one final day to post your off topic thoughts. Perhaps that is an April Fool's joke? Kind of not funny though. I believe this for about 3 seconds and I did a little digging, know what I found? Evidence that points to this being an April fools. It doesn't need to be but it will be because it was created at Pat's request and has become a spam breeding ground. This proves that Evidence wrong.